The Official Disney Store Blog put out the following notice today on how it plans on handling the constant low stock of highly requested and desired Frozen items. You may have noticed a few changes this weekend at your local Disney Store as it relates to purchasing Frozen products. We are thrilled that the story of Anna and Elsa has touched the hearts of so many, and we have been working around the clock to get product back on shelves as soon as possible. At Disney Store, we strive to provide an exceptional Guest experience for everyone and creating an equitable way to purchase Frozen product is part of our ongoing effort to deliver on that commitment. All Stores will be replenishing Frozen items as shipments are received. Select product, including dolls and plush, will only be available for sale on Saturdays at Store opening. For the Elsa Costume, opportunity drawings to purchase one costume per Guest will be held on Saturdays. Drawings are determined by individual Store inventory, so please check back here on Fridays for a complete list of participating Stores. At participating locations, Cast Members will be explaining the rules in full detail Saturday mornings, prior to the opportunity drawings. Please note, drawings are conducted by size, and Guests can only enter for one opportunity drawing. The 2 item per Guest limit remains in effect for select Frozen merchandise both in Stores and online. 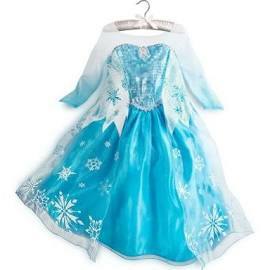 As stated above, the Frozen Elsa Costumes will be limited to one per Guest. This process pertains to Disney Store locations in U.S. and Canada until further notice. Please note, Outlet locations do not have the Elsa Costume in their inventory, and therefore will not be participating in the opportunity drawing process. We anticipate Frozen product being back in stock in Stores come July/August and will continue to evaluate the need for these purchase methods to ensure the best possible Guest Experience. In addition, or for those Guests who prefer to shop online, please continue to check DisneyStore.com as Frozen product is replenished weekly. We thank you for your continued support and loyalty, and we hope you have a Magical day. With people buying these items and reselling them at insanely inflated prices online we wonder what do you think about these changes? Needed? Or perhaps a little to late?